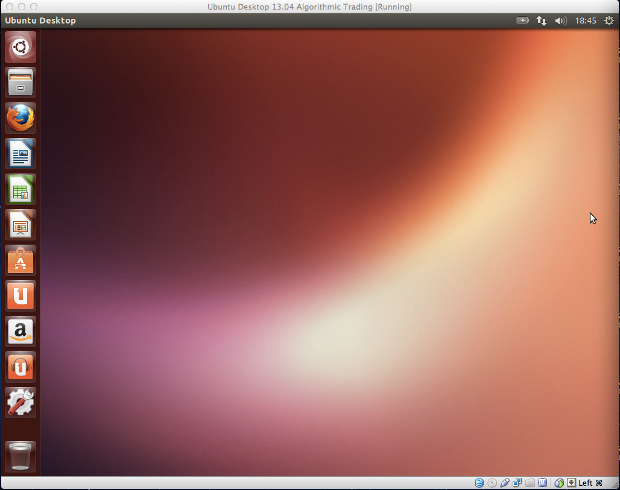 In this article I want to discuss how to set up a robust, efficient and interactive development environment for algorithmic trading strategy research making use of Ubuntu Desktop Linux and the Python programming language. We will utilise this environment for nearly all subsequent algorithmic trading articles. These tools (coupled with a suitable securities master database) will allow us to create a rapid interactive strategy research environment. Pandas is designed for "data wrangling" and can import and cleanse time series data very efficiently. 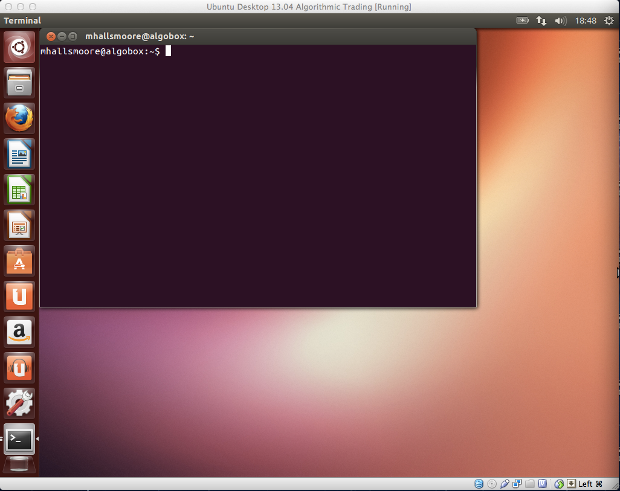 NumPy/SciPy running underneath keeps the system extremely well optimised. 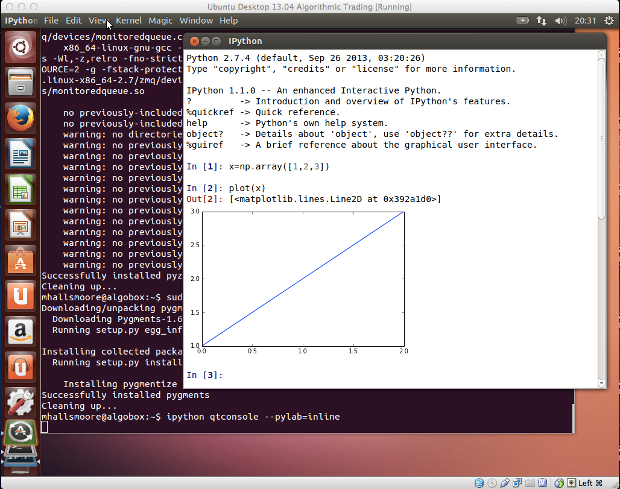 IPython/matplotlib (and the qtconsole described below) allow interactive visualisation of results and rapid iteration. scikit-learn allows us to apply machine learning techniques to our strategies to further enhance performance. 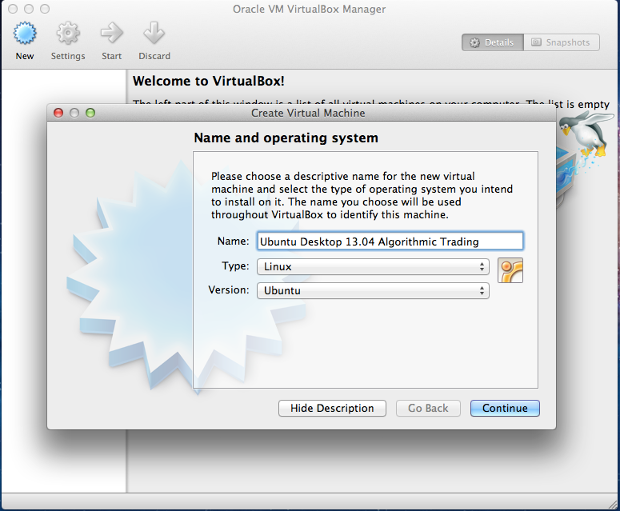 Note that I've written the tutorial so that Windows or Mac OSX users who are unwilling or unable to install Ubuntu Linux directly can still follow along by using VirtualBox. 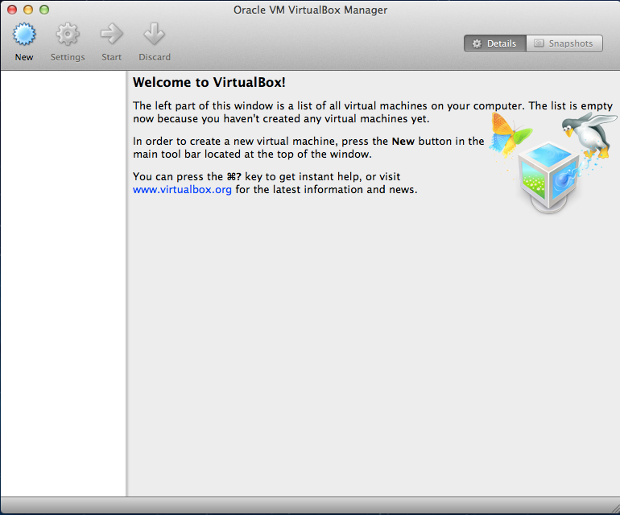 VirtualBox allows us to create a "Virtual Machine" inside the host system that can emulate a guest operating system without affecting the host in any way. 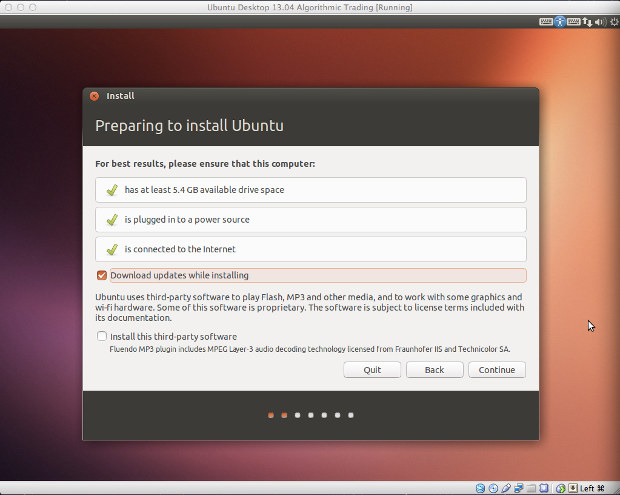 This allows experimentation with Ubuntu and the Python tools before committing to a full installation. 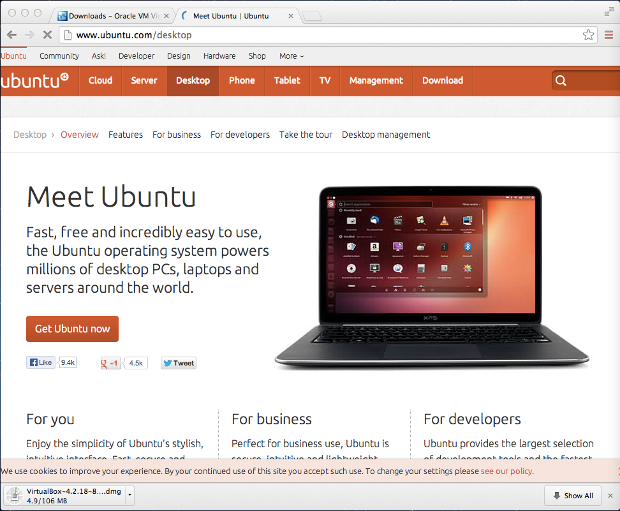 For those who already have Ubuntu Desktop installed, you can skip to the section on "Installing the Python Research Environment Packages on Ubuntu". 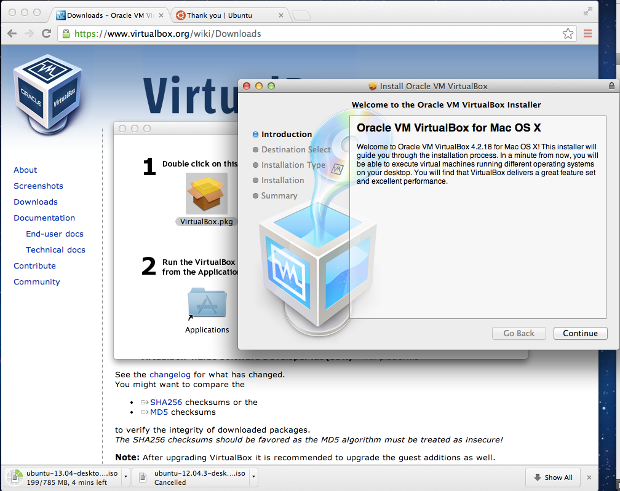 This section of the tutorial regarding VirtualBox installation has been written for a Mac OSX system, but will easily translate to a Windows host environment. 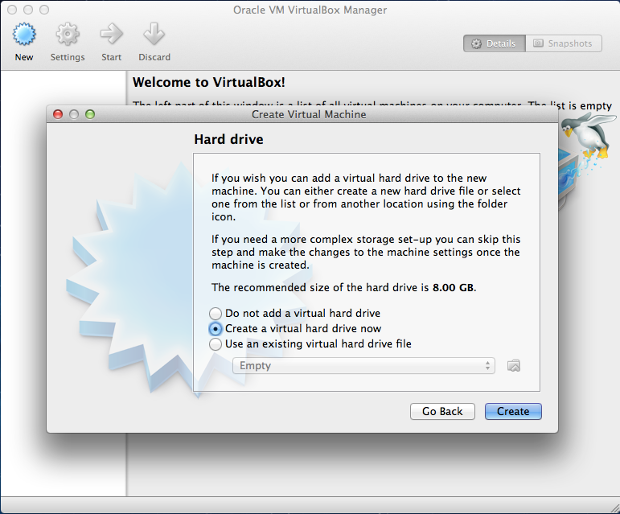 Once VirtualBox has been installed the procedure will be the same for any underlying host operating system. 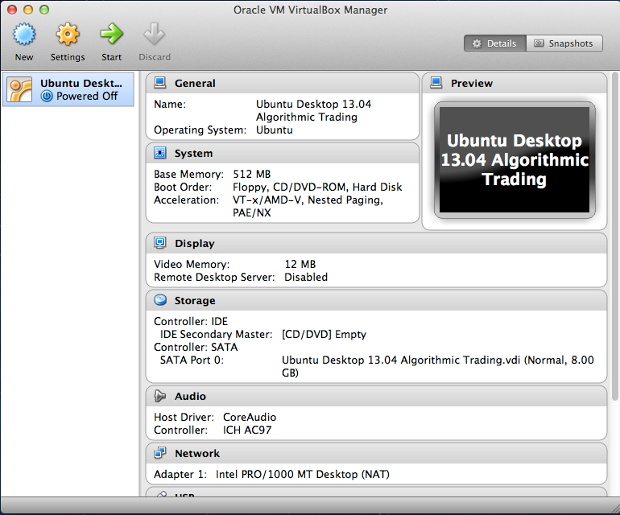 Before we begin installing the software we need to go ahead and download both Ubuntu and VirtualBox. You will be asked to contribute a donation although this is optional. 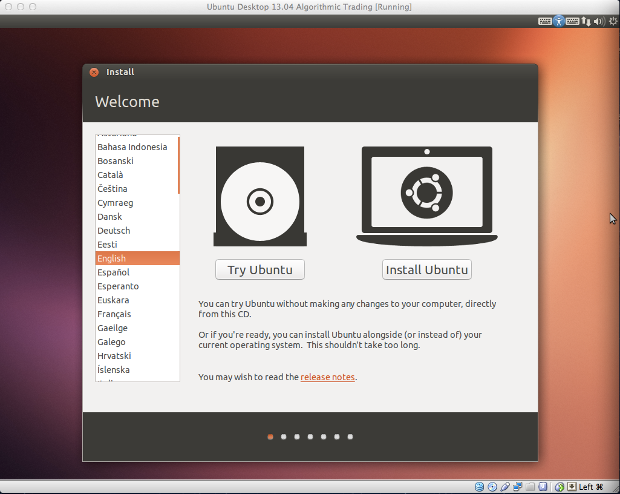 Once you have reached the download page make sure to select Ubuntu 13.04. You'll need to choose whether you want the 32-bit or 64-bit version. It is likely you'll have a 64-bit system, but if you're in doubt, then choose 32-bit. 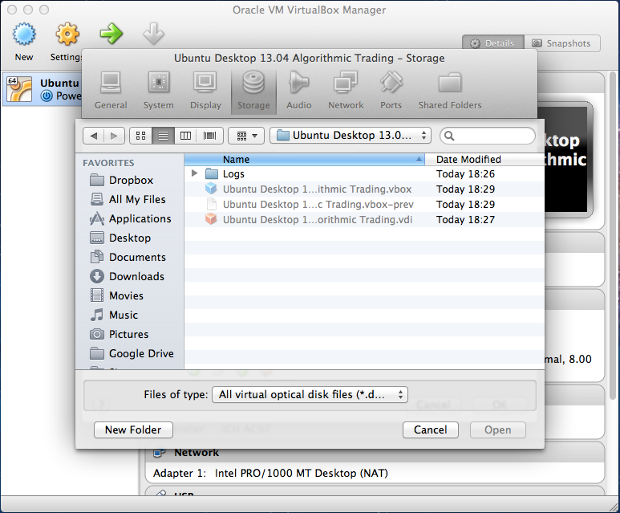 On a Mac OSX system the Ubuntu Desktop ISO disk image will be stored in your Downloads directory. 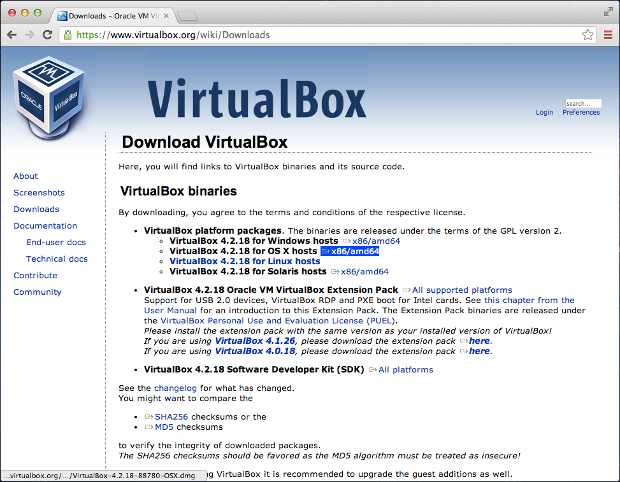 We will make use of it later once we have installed VirtualBox. Now that the Ubuntu Desktop is installed we can begin installing the algorithmic trading research environment packages. All subsequent commands will need to be typed into this terminal. 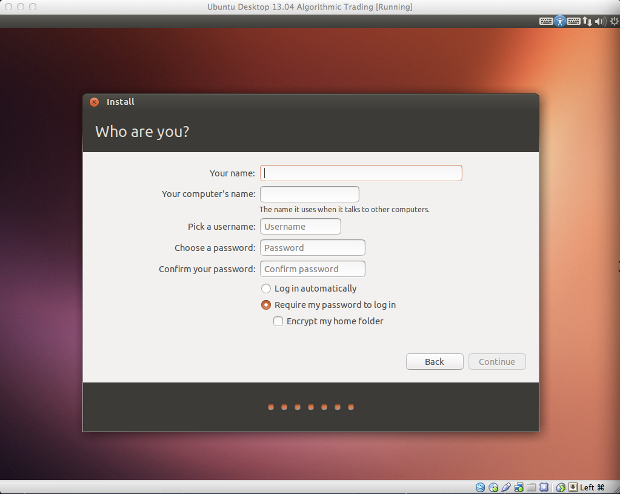 Note that the -y prefix tells Ubuntu that you want to accept 'yes' to all yes/no questions. 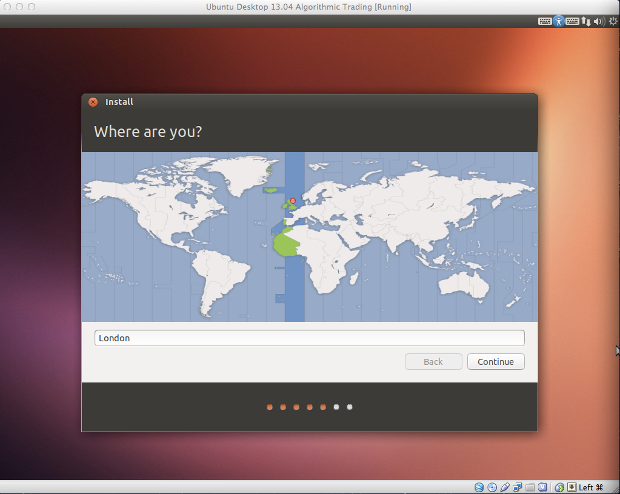 "sudo" is a Ubuntu/Debian Linux command that allows other commands to be executed with administrator privileges. Since we are installing our packages sitewide, we need 'root access' to the machine and thus must make use of 'sudo'. To remedy it just run "sudo apt-get -y update" again or take a look at this site for additional commands to run in case the first does not work (http://penreturns.rc.my/2012/02/could-not-get-lock-varlibaptlistslock.html). Once the necessary packages are installed we can go ahead and install NumPy via pip, the Python package manager. Pip will download a zip file of the package and then compile it from the source code for us. 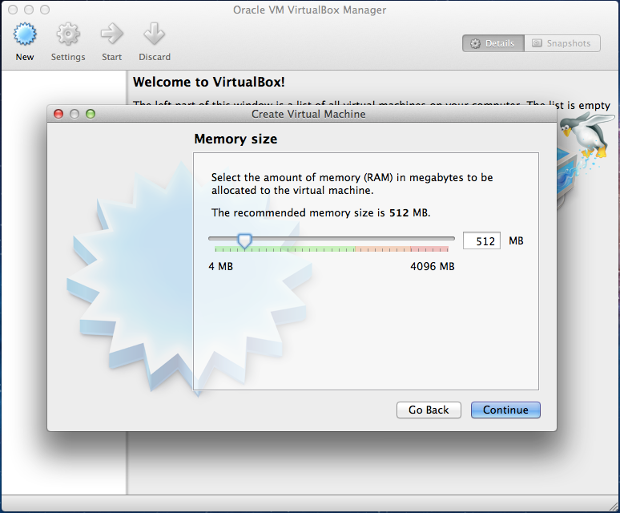 Bear in mind that it will take some time to compile, probably 10-20 minutes! While IPython is sufficiently useful on its own, it can be made even more powerful by including the qtconsole, which provides the ability to inline matplotlib visualisations. However, it takes a little bit more work to get this up and running. That's it for the installation procedure. 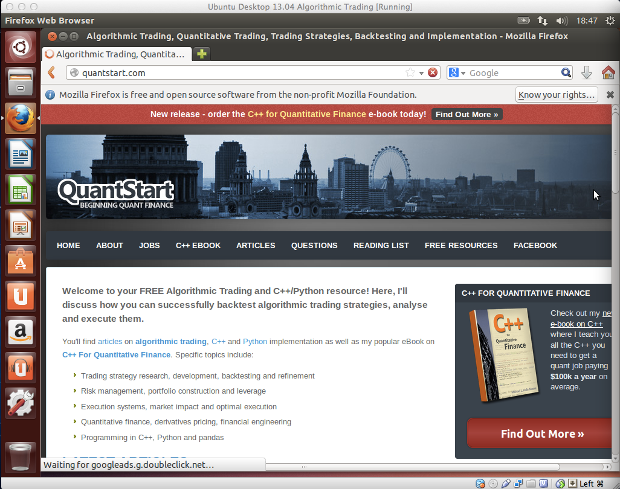 We now have an extremely robust, efficient and interactive algorithmic trading research environment at our fingertips. In subsequent articles I will be detailing how IPython, matplotlib, pandas and scikit-learn can be combined to successfully research and backtest quantitative trading strategies in a straightforward manner.